The basement has been a bit of a wreck the last....oh pretty much since we moved in. We are in need of some good storage shelves, some good bins for things to have a place, and some walls would be nice to section off the enormous room. In the meantime we were all encouraged, by Mickey of course, to clean up the space so we could use it better. There were piles of off season or too small clothes, piles of toys that weren't put away properly, and boxes that had never been unpacked. Yikes! Mattey was thrilled to find her long lost pachyderm family. They did need to be aired out though. We moved and unpacked boxes, sorted through clothes, threw away garbage, moved toys into a place of their own, and set up the old kitchen table so this could happen. 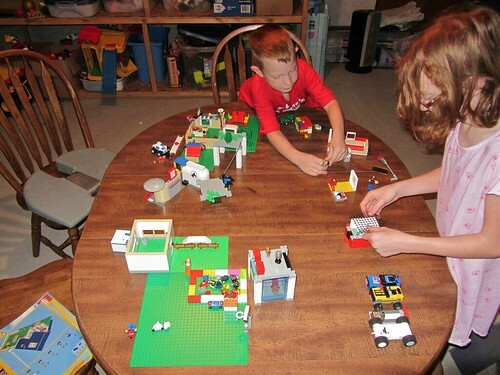 The reds have been in the basement for a while now, playing Legos. It's nice that they have a place to leave their city standing for another day(s) of play. Why didn't we do this sooner?